Something To Smile About - Cantaloupes! 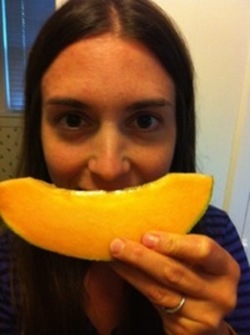 Cantaloupe Grin!Cantaloupes are a plenty right now- I got one recently for $2.50- Organic! Also known as muskmelon, cantaloupe can help lower blood pressure, lower blood cholesterol, and in general lower risk of heart disease. Cantaloupe boosts the immune system and because of it's high antioxidants it can be eaten to protect againstmacular degeneration. It supports liver health has antitumor properties and is anti-inflammatory. Select cantaloupes that are firm but with a bit of "give" in the rind. They should smell sweet, have no mold and not be too green looking. Above all- look for that distinct cantaloupe smell! I never did like it as a kid but I love them now, proof that our tastes do evolve- so keep trying new things! I prefer it room temperature- unless its a scorching hot day. Fruit should always be eaten on a COMPLETELY empty stomach as it breaks down quickly. Melon's break down the fastest in the stomach of any fruit as they are mostly water. Eating fruit for desert can cause fermentation in the intestinal tract leading to bloating, gas and colic. When your really hungry- reach for fruit first! Wait 15-30 minutes for fruit to pass out of the stomach before consuming more food. - OR wait for your stomach to tell you your hungry! Best of all Cantaloupes can help you to feel less stressed out, with minerals like potassium, magnesium and healthy natural sugars- they make you feel GOOD! Go out and buy one!